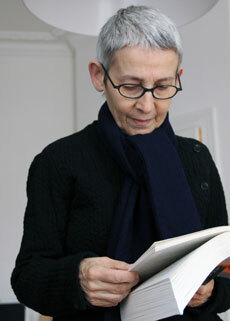 Mari Mahr was born in Santiago de Chile in 1941. She was brought up and educated in Santiago and in Budapest, Hungary. In the early 60s - inspired by Jean Seberg's cub-journalist character in Godard's 'À Bout de Souffle' - Mahr enrolled at the School of Journalism in Budapest, where she received her Diploma. Simultaneously she became a trainee press-photographer at the Cultural Department of the Hungarian News Agency. Over the next few years Mahr underwent a rigorous apprenticeship in photography with some of the greats in Hungarian photojournalism including Endre Friedman and Gábor Pálfai. In 1973 having moved to London she continued her studies at the PCL where she received her BA Degree in Photographic Arts under Derek Drage, Gus Wylie, prof. Margaret Harker and Victor Burgin. Her first solo exhibition took place at the Photographers' Gallery in London starting a long term association with the gallery which continues till today. Mari Mahr has also had long term professional connection with Zelda Cheatle who exhibited her work in her gallery and represented her for over 10 years. After her successful exhibition at the Serpentine Gallery in 1980 Mahr began giving talks and lecturing at Art Schools and Universities all over Britain - amongst them the Royal College of Art, Glasgow School of Art, Napier University Edinburgh. In 1989 she received the prestigious Fox Talbot Award at the National Museum of Photography, Film and Television in Britain. A British Council retrospective took Mahr back to her native Santiago de Chile, as well as Argentina, Hungary, Spain and Greece. Her work is now in collections worldwide, including the Victoria and Albert Museum in London, The British Council, the Bibliotheque Nationale in Paris, the Tokyo Museum of Photography, the National Gallery of Australia in Canberra, National Galleries of Scotland in Edinburgh and the National Museum of Photography in Hungary. She lives and works in London, but divides her time between London and Berlin.